Harvey Green thinks his sales copy is finally ready. His research has been more in-depth than usual; and he’s weaved a variety of true benefits into his copy. He has checked his spelling, and replaced gobbledygook with meaningful phrases. So that must be it. Phew. Harvey smiles and imagines his writing teacher praising his efforts. He pours himself a glass of Rioja to celebrate, and takes the remainder of the evening off. The next day, Harvey does a final check before publishing his copy. He imagines stepping into the shoes of a web visitor, and reads his copy aloud. He realizes he has assumed web visitors already know who he is and that they already trust his advice. But now he realizes … his copy lacks credibility. And, of course, if people don’t trust his words, they won’t buy from him. 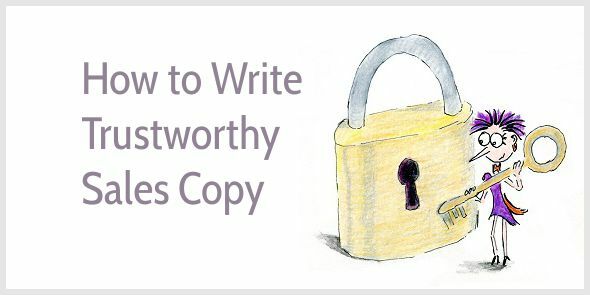 Boosting your trustworthiness requires two specific copywriting actions. Shall I explain? Generic statements sound like marketing blurb. In contrast, a specific statement sounds more believable. For services, you can do the same. Describe your process in detail and explain what you deliver. We set up a quick interview (30 minutes or less) with your client and send them a list of questions so they can prepare. Our team knows exactly what to ask to get those juicy details and powerful quotes marketing teams dream about while treating your clients with professionalism and respect. What you can do next to make them even happier! The copy includes specific facts: the interview takes 30 minutes or less; and a list of questions is sent beforehand. Sales copy is often too short and too superficial, and that’s why it fails to instill trust. So, dig deeper to describe your process and demonstrate your expertise. Include specific details to instill trust. Specificity is a form of internal trust building because you give specific details of your product, your service, your process. External trust elements, however, provide credibility from outsiders, such as test results, testimonials and other forms of social proof. Together, internal and external proof jack up your trustworthiness. [T]he first enewsletter I wrote using the course material was our most successful ever. Our open rate increased marginally, but our click rate jumped from 5.82% to 41.23%—concrete evidence that the course works. Sales were also good with people coming in, calling and emailing. Don’t place your testimonials on a separate web page or at the end of sales copy. The most powerful testimonials are an integral part of your sales copy. When writing sales copy, it’s easy to get distracted by persuasive sales techniques. By subject line tricks that increase conversions. By power words. By sales letter formulas. But does the copy still sound like you? Consistency is the basis of trust. So, don’t use words that make you sound sleazy. Don’t follow writing advice if it doesn’t align with your values. Don’t feel you need to brag. Trust your own gut instinct. Be honest. And be yourself. What a great post. I struggle with consistency, and yet I set up my life to be so jam-packed that consistency is almost impossible to achieve. Time for some soul-searching on that one. And specificity is something I definitely also need to get better at. It’s so easy to be vague about an online course. Thank you, as always, for your generosity and guidance. I agree that it’s hard to find consistency, especially if you’re running around. For me, the only way to achieve consistency is to focus on essentials only. It’s almost like: Do as little as possible, but try to do it well. It’s a continuous struggle as I always feel I should do more, but I keep reminding myself to focus on a few tasks only, and that that’s enough. And I can’t wait for your webinar with Unbounce. We’re a good “match,” Julian, as I like writing posts that aren’t thousands of words long! Between 900 and 1,200 words works great for me as a blogger: Long enough to write something meaningful, and short enough to write it well. See you at the Unbounce webinar. Thank you for registering! This is so authentic. My biggest takeaway is to be specific with figures. I shouldn’t assume they know. Going to try this out as soon as possible as I’m currently writing a sales page. Thanks for sharing. Off to share this. Yes, figures are great for adding specificity. This can be as simple as writing you’ve been in business since (say) 2012. I am still plugging away. Nice to read one of your posts again. People are quite right not to trust what is written online. When people read lose 25 pounds in a week or make millions working 2 hours a day all over the internet it’s hard to discern what is true and what is not, for many. Trust is a difficult thing to gain with all the misinformation online and your tips, as always, are something I can put into practice immediately. I think I will go back to a few of my post and remove the links to the testiminials then place them front and center. Often I read your advice, slap my head and think it’s so obvious why haven’t I been doing that? Great stuff. I am not sure if it’s your writing and guidance that I miss or if it’s seeing Henrietta. Either way, a visit to your website is always time well spent. That’s so true, Barry. I’m tired of everyone trying to sell us quick solutions, short cuts and fool-proof blueprints. Life is hardly ever as easy as people promise it to be. You know what? This is kind of advice I revisit when I am struggling to come up with convincing and persuasive sales copy. So as I already mentioned, I copied this post onto a Word file and put it in my Write Better folder. Look forward to more practical advice like integrating a testimonial in my sales copy instead of hiding it somewhere else. Exactly what I need to learn, Henneke, and I was totally worried I’d never be able to absorb and remember it all, but then noticed the webinar. YAY! I cannot attend, but have registered and will eventually be able to enjoy it. I am so glad. Thank you for registering, Katharine. I hope you’ll enjoy the webinar. ” Often I read your advice, slap my head and think it’s so obvious why haven’t I been doing that?” – exactly how I feel every time. I even used to think that writing a sales copy was an easy task. I know better now ? I’ve learned so much here on your blog and from your courses. I agree with you … Writing good content is actually quite hard work. But I find the efforts to write well very rewarding when I see the result, i.e. the final piece of content. Thank you for your kind words, Irina! Henneke, I so love your closing to be yourself. Too many times we go with the techniques others lay out because we don’t trust our own gut. There’s nothing wrong with incorporating their ideas but make it your own. Kind of like a recipe that you tweak to your taste. I believe we each have something unique to offer and readers/customers connect with that. Thank you, Cathy. It feels weird to me when I follow a blog and enjoy it, and then get a sales message and it’s very off-putting because it’s so pushy. That doesn’t feel natural to me. I like the idea of swipe files, but only as a way to understand what works and what doesn’t — never to imitate sentences or re-use words that sound unnatural to us. I agree with you – make their ideas your own! Just did a different https as the other did not go through for some reason. I’m writing copy for our temp website while it’s being redone so this is very timely. As always, thanks. I’m glad this post is timely for you, Anita. Happy writing! The advice to ignore a technique if it doesn’t align with your values is key for me. I just have to remember how I recoil whenever I read the “I made a gazillion dollars using these 3.5 simple tricks” -type copy. Ugh! Thank you for your tasteful (yet effective) techniques instead, Henneke. ? I sometimes wonder whether I’ve become too sensitive, whether I’m too easily put off by pushy copy. But it sounds like I’m not the only one! Thank you, as always, for stopping by, Alison. I appreciate it. I don’t think we’re too sensitive, there’s just too much of the copy-paste stuff around ?. Apple examples are a win – they are so classy and yet completely compelling as well. I’ve noticed recently that some marketers will use a very credible writing approach which I find appealing, and then next thing you know I receive a very aggressive email with a strong sales pitch. That’s cognitive dissonance to me. I have been guilty of the same thing, and thanks to your teachings in the copywriting course I am learning to tone it down. I like your term “cognitive dissonance” because that’s exactly what happens. While sales copy may have a different purpose than blog posts, that doesn’t mean we need to change our writing voice – it makes it almost look like we have a split personality! Thank you for your lovely comment, Ray. It can be difficult to refrain from slipping into sales copy mode instead of remaining consistent. It’s as though we have to conform to a particular ‘standard’ and use those well-worn phrases. Yes, I know. It’s like we switch on a button in our brains, and at once we take on the personality of a pushy car salesman. Is it because there’s too many examples of pushy sales content online? Thank you for stopping by again, David, and for sharing! Thank you for this anti snake oil merchant post. It is so weird when I am interviewing candidates I am like a Rottweiler for specificity, drilling down on my candidate’s responses to questions on the search for real gold – what you did, how, why, the results etc. But I was struggling to create the landing page content for my first ever value-packed FREEBIE. I had the headline covered, fab images, the benefits listed but still something was missing. I felt lost, frustrated and vexed. The missing ingredients are specificity and and the real me – rule breaker vibe 🙂 Off to apply both liberally to my landing page draft. YAY! Cheers as always for your uncanny timing. Ha, yes! With interviewing it’s exactly the same – you want to get to the real stories and the details, not the fluffy superficial marketing speak. I hadn’t thought about that way, but it’s exactly the same as writing sales copy. Good point. Specificity is key. I think it’s one of the most important things regarding any type of sales copy. Or any copy in general. “When writing sales copy, it’s easy to get distracted by persuasive sales techniques. By subject line tricks that increase conversions. By power words. By sales letter formulas. That’s so important. You don’t want it to sound hypey. You definitely don’t want it to sound like a robot. Having it sound like you, and your readers knowing it sounds like you, will increase your level of trustworthiness. Oh my, I completely missed your comment early December. I’m sorry! And yep, let’s sound like the person readers know rather than some hypey salesman. Happy New Year, Andrew! Once in a while I get involved with helping a client fix up their website, and if I don’t duck really hard that means talking copy. 95% of the time that’s a tough conversation because almost everyone resorts to bland and vague, which means a) they sound like everyone else b) they’re not convincing and c) even worse, for lots of service businesses you can’t even figure out what they actually DO! I think i’m going to send them straight to this post as a starting point, in future. Thank you for your lovely comment, Kate. I agree with you that there’s a lot of bad copy around on the web. The problem is that with so much bad copy, it’s difficult for people to know what good copywriting is. Everyone seems to follow the bad examples!